When eighth-graders in Nancy Foote’s science class at Sossaman Middle School need to learn a concept or work on an assignment, they just need access to her instructional videos on YouTube and their classroom account on Edmodo. 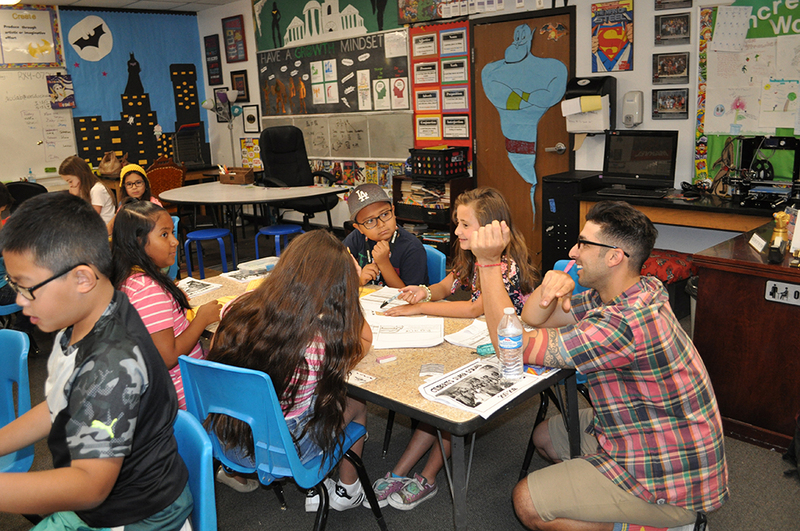 “They come to school the next day and their conversations are so rich and so deep that it just blows me away,” said Foote, a National Board Certified Teacher and Arizona Master Teacher. 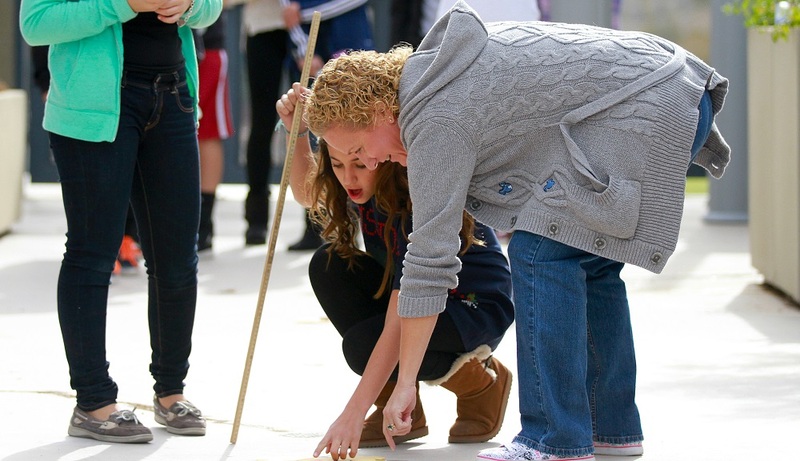 Sossaman Middle School eighth-grade science teacher Nancy Foote discusses an activity with a student during class. Foote uses blended learning in her class. Photo courtesy Carlos Espinosa/Higley Unified School District. Foote’s students, like many others in Arizona public schools with blended learning environments, spend a portion of their time learning content through digital or Internet-based media in addition to traditional classroom instruction. A growing number of public schools in Arizona are using blended learning to increase student engagement and achievement, including those in districts in Casa Grande, Higley, Kingman, Kyrene, Madison, Maricopa, Mesa, Prescott and Vail as well as Carpe Diem, a Yuma charter school. K12 at the Y i-Learn Centers in the Phoenix Metro area, Flagstaff and Yuma created by a partnership between Valley of the Sun YMCA and Arizona Virtual Academy also use blended learning. Blended learning does make a difference, said Dr. Denise Birdwell, superintendent of Higley Unified, which has been using the model for the past three years. 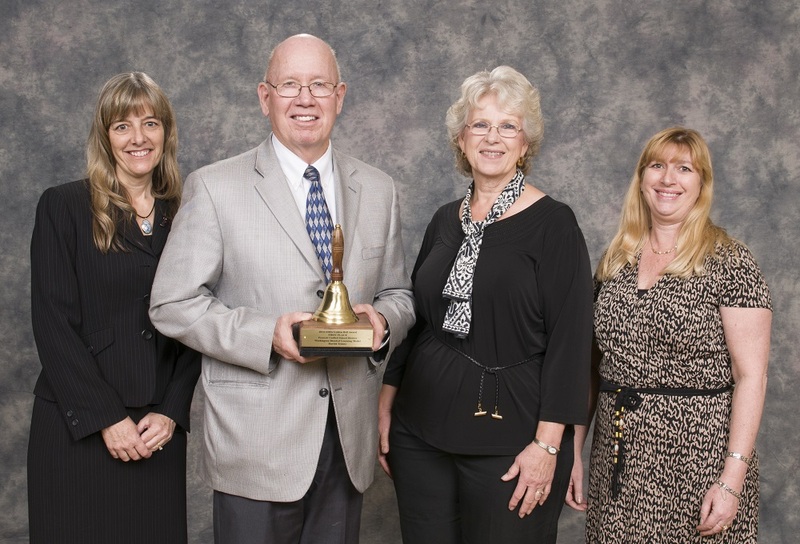 Washington Traditional School in the Prescott Unified School District was honored with the Arizona School Boards Association’s 2014 Golden Bell Award for elementaries for their blended learning program. From left to right, teacher Karen Sampson, Principal Harold Tenney, and teachers Penny Nicholas and Pam Percival. Photo courtesy of Mike Eller Photography. A student can come in a year behind and will be caught up, through multiple means including access to technology and software from home and classroom use of math and reading adaptive learning technology resources from DreamBox Learning, Birdwell said. Blended learning directed by teachers has led to four to six months of growth in students’ reading levels in the first two months of this school year and four to nine months of growth in math, said Harold Tenney, principal of Washington Traditional School in the Prescott Unified School District. The benefits include data-driven intervention, targeted instruction by intervention staff, engaging digital-learning resources, additional time for direct instruction and cooperative learning and effective, efficient differentiation, Tenney said. One key to blended learning’s success is how focused it is, Foote said. Students don’t have to be home to do their work if they have mobile phones or tablets to access instruction and activities online, Foote said. Blended learning is student driven, Foote said. “I can repeat something over and over until you make sure that you have it in your brain the way you need it in your brain,” Foote said. By the time parents meet her, they know her voice, face, what to expect and “they’re very comfortable with me. The kids are, too, because I’m part of their world,” Foote said. 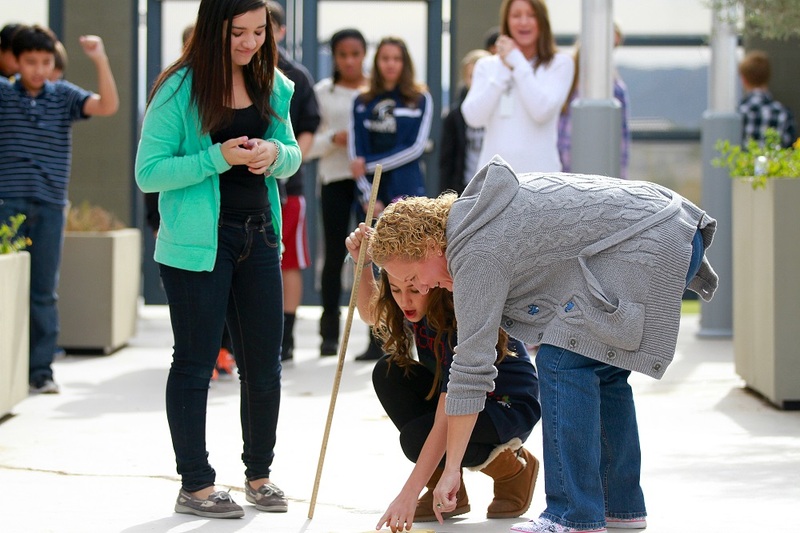 Sossaman Middle School eighth-grade science teacher Nancy Foote and her students do an activity. Foote uses blended learning in her class. Photo courtesy Higley Unified School District. If parents want to know what she’s teaching, Foote said they can go to her YouTube channel, video page and blog. Another key to blended learning is having master teachers, Tenney said. Teachers using blended learning often say they do not do paper, Birdwell said. The model also helps students who are shy build confidence and engage in the classroom differently, Birdwell said. The blended learning model at Washington Traditional replaced self-contained kindergarten- through fifth-grade classrooms with multi-grade teams with one teacher for math and science, another for language arts and social studies and also enlists academic intervention teachers and para-professionals. Students spend a one-fourth of the day in an instructional computer lab using STAR Math and Reading from Renaissance Learning and other resources. The schedule lets team members meet during a common prep period, said Pam Percival, third-grade English language arts teacher at Washington Traditional. Each day, teachers make instructional decisions about what kids need and the students are growing more because of it, said Karen Sampson, kindergarten-/first-grade math teacher at Washington Traditional. Teachers also can easily differentiate instruction for all students, Sampson said. “I’m a big advocate for gifted students, and sometimes they get left aside, but with this interactive, technology-based instruction students can go at their own level as far as they want,” Sampson said. “For students who need more practice, we have an opportunity to work with a second, third or fourth person through the lab time to reinforce what is happening in the classroom so those students also rise up,” Sampson said. Please right click then open in new tab to enlarge infographic. Students complete assessments in the instructional computer lab, which “gives me more time to do project-based activities, student engagement and co-operative learning activities,” Percival said. Tenney has “empowered the staff with a model they were able to experiment with, and teachers made decisions as a team,” said Joe Howard, Prescott Unified’s assistant superintendent. “You can’t do any better for morale in my opinion,” Howard said. Teachers are also interested in using blended learning for their own professional development, Neville said. “We have to work with teachers to create the change we want to see in the classroom for kids,” Neville said. 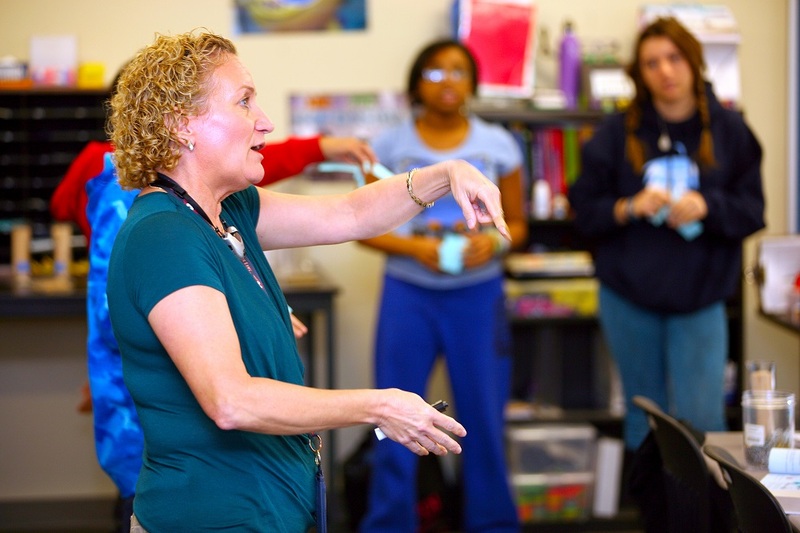 As part of the Kyrene Teaches with Technology Project, master teacher mentors help other teachers integrate technology into their instruction, Neville said. The project has been recognized by the National School Boards Association, and continually evolves, Neville said. 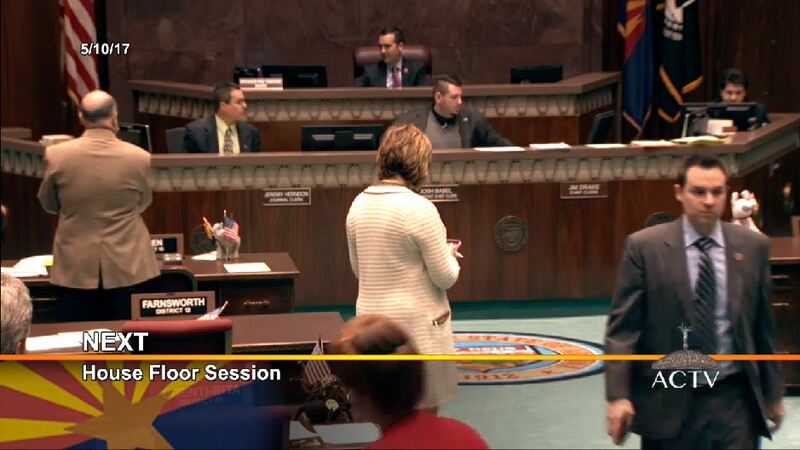 After years of budget cuts in Prescott, blended learning began as a creative way to restructure Washington Traditional and combine effective teaching, support services and digital learning, Tenney said. The district provided $30,000 for additional technology hardware and software, an estimated $90,000 annually was saved by staff restructuring, 8 to 17 percent was saved in teacher staffing and the change did not require increased class sizes or additional classrooms for labs, Tenney said. “In Higley Unified we were fortunate enough to have a capital override for technology. That was our kick start,” Birdwell said. Each teacher received a laptop and a Smart Board was installed in each classroom. Throughout the district there are laptop carts, tablets, flipped classrooms where students listen to lectures online at home and do discussions and projects in class, and online programs, Birdwell said. Kyrene’s project began with one elementary school and a middle school and will continue to expand over the next several years to all 25 schools and 17,000 students, Neville said. 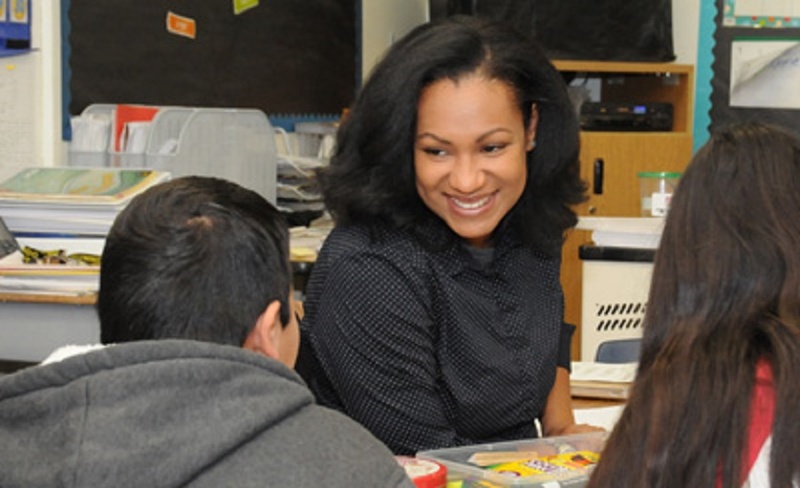 “We’re deploying as teams who bring a content specialty or skill and go out and support schools,” Neville said, noting that math and literacy coaches at each school are involved. While Prescott Unified will be closing Washington Traditional School next year as part of the district’s budget cuts, its blended learning model will continue at another district school, Tenney said. In a survey at the end of last year, Washington Traditional asked parents if the blended learning model met the academic needs of their child. Eighty-four percent agreed, and six percent somewhat agreed, Tenney said. “In the next five years most schools in the nation will be doing blended learning, because it does work,” Tenney said.